Spinning out of the annual Vengeance pay-per-view, the action continued on WWE’s Monday Night Raw in Austin, Texas. The show seemed to suffer from some poor choices with its use of air time, but overall it was an entertaining show. A lot of ground work was laid for the next big event, November 20th’s Survivor Series, and the return of the Rock. Tonight’s Halloween edition of the show should continue to move things in that direction, but the real treat will be special guest stars, The Muppets. When the Rock and Muppets are mentioned together I can’t help but think of Derek Jeter. PTB: I was excited about seeing fallout from Vengeance myself, but come on, Jerry Lawler. You’ve seen something like what happened with The Big Show and Mark Henry before in your career. Brian: I thought that at first too. 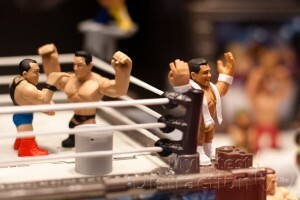 Then I saw the images of the John Cena / Alberto Del Rio match in the imploded ring. That’s cool! PTB: I do love that they left the imploded ring set up for the Last Man Standing match. It was a little weird hearing Triple H comment about the “Kliq” in reference to Kevin Nash returning to attack him at Vengeance. I’m sure it’s been mentioned before, but it was still a little surprising. Brian: They have mentioned the Kliq many times before in storylines. Shawn Michaels and Bret Hart touch on it quite a bit in their new DVD. PTB: The Greatest Rivalries DVD really caught my attention when the ran the commercial. I actually made it a point to pick one up on Tuesday. Brian: it was really good. It made me miss the old days of 15-20 minute matches that told a story more than 15 minute long promo segments. PTB: While referencing his old friends, Triple H invokes Sean Waltman’s name alongside Shawn Michaels and Kevin Nash, I can’t imaging he’s coming back. There was no mention of Scott Hall. Brian: I think they are intentionally staying away from Hall due to the E60 piece that just aired about him. He looks horrible! PTB: That’s a heartbreaking story. I wan’t aware that had been put together. I really enjoyed Triple H’s reaction when he called out Nash and John Laurinaitis answered. It was genuine and went along with his “shoot” diatribe on friendship in wrestling (“You can either make friends, or you can make money”). It also highlighted what a stiff Laurinaitis is. Brian: That’s why allowing these guys to simply say what they feel instead of relying on a scripted promo is so much more appealing. It feels real and is more entertaining. PTB: Nash eventually shows up and attacks Triple H again. The first attack was handled well, but the second attack was completely unnecessary. It was brutal, don’t get me wrong, but now two segments were spent on this attack and half of a third with the recap. At a quarter of the way through the show, that was all that had happened. I’d have accepted Triple H being off the air for a few weeks with just the first assault. Brian: Agreed. No need for it, but I would have liked to see HHH land “face-first” on the concrete while being stuck in the backboard ala Rey Mysterio/Big Show. PTB: I’m beginning to tire of Randy Orton being the opening match on Raw. It feels like this has been the booking for weeks now. PTB: It’s not nearly as insufferable as Michael Cole’s attempts to cover Sheamus’ efforts to acknowledge his Celtic heritage. I like the idea, but Cole’s method of working it in is painful. I think he needs to be gone for a while after this next match with Jim Ross. PTB: Santino complaining about the inaccurate announcement of his weight was fantastic. I’ve missed this guy and I’ve even missed the Cobra. 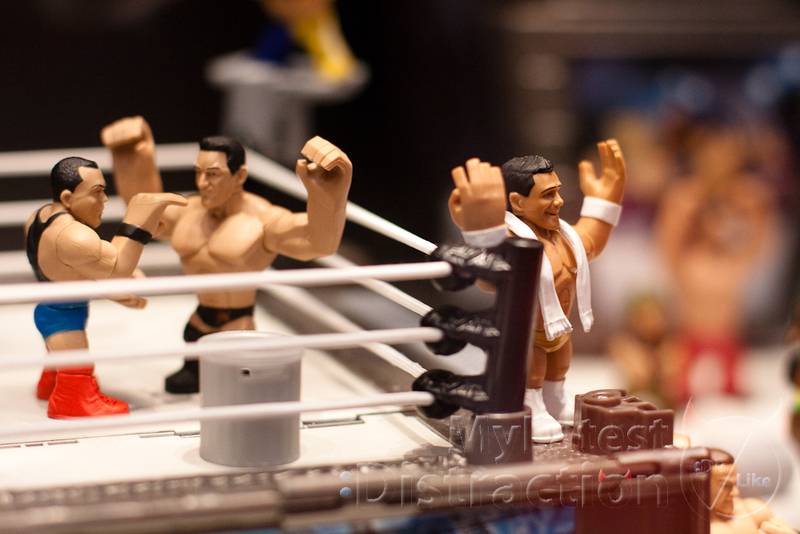 I saw a great Santino WWE Rumbler action figure (along with a bunch of other WWE figures) on display at New York Comic Con a few weeks ago. Brian: I totally missed that. Santino is so good. I’m worried that he’ll be the victim of a roster trimming in the near future. PTB: I love the prospect of C.M. Punk versus Del Rio now that Cena seems to be out of the picture. I really thought we might see someone new challenging the current champion to tighten up the whole Miz/Truth/Cena/Punk/HHH/Nash angle. Brian: I’m afraid that Punk is out of that angle altogether. It’s a shame because he should be the centerpiece. PTB: Del Rio and Punk started to build toward a possible Survivor Series match and I think both made a good showing before Laurinaitis interrupted. Punk handled a lot of Laurinaitis’ weaknesses during their confrontation. The respect thing reminded me so much of Brian Pillman and Kevin Sullivan back in WCW. Brian: Oh yeah!!! I remember that. Punk definitely made up for the “Funk Man” being absolutely horrible. I’m really hoping that whoever is behind his involvement reveals their identity soon so he can go back to being “the executive vice president of talent relations” (if I hear him say that one more time, I’ll jab a pen into my ear). PTB: As “intellectuals,” I suppose we have to mention Wade Barrett, even if his match with John Morrison felt like a lot of filler on the show. It was one of the better matches of the night, but it just felt out of place. Brian: Another squash of Morrison. This could possibly just be serving as punishment for Morrison for some sort of backstage behavior. He’s been jobbing a ton recently. I’m thinking maybe that if he sticks with it, he could be in line for a push much like HHH with the whole Kliq incident at Madison Square Garden. Also, I think this might be the beginning of a push for Barrett as he disposed of Morrison on Raw and Daniel Bryan on Smackdown fairly easily. PTB: I wouldn’t mind that. Zach Ryder’s air time gets even more high profile as he’s put into the main event as John Cena’s tag team partner against the Awesome Truth. At least that was how it was supposed to happen. Brian: A lot of people are pushing for Zack Ryder, especially his peers. PTB: I feel like they should have held the commercials for the Rock being at Survivor Series until after tonight’s show given his booking as Cena’s tag team partner. They had already waited a long time to officially began the hype of the Rock’s in ring return at Survivor Series on TV, another week couldn’t have hurt. Brian: I thought so too. It totally gives away the storyline. PTB: Coming out of one of the commercial breaks, a “Twitter Frenzy” graphic was displayed talking about WWE trending during Vengeance. They’ve been very quick to throw out Twitter addresses wherever they can lately and in some cases I think it’s working well. However, I can’t help but think a big part of it trending during a pay-per-view lies in people who aren’t buying the show trying to get updates. Brian: Absolutely. There is talking of putting all of the secondary PPVs on the new WWE network and leaving the big 4 (Royal Rumble, WrestleMania, SummerSlam and Survivor Series) on PPV. Who want’s to pay $55 for Vengeance? PTB: I don’t know about you, but I can’t wait for the Muppets to guest star tonight on Raw. I honestly thought the mention of their appearance was a joke when HHH offered Punk increased security for that night a few weeks back. Brian: I really couldn’t care less. It’s just another excuse to put Hornswoggle on TV and I can’t stand him. Finlay’s gone and he should be too. PTB: I can’t believe you’re not interested in the Muppets, but it’s more shocking that you would immediately equate Hornswaggle to Finlay. That guy has a history prior to being a leprechaun’s sidekick. WWE Monday Night Raw airs Mondays at 9PM on the USA Network.